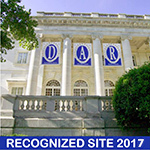 The National Society of the Daughters of the American Revolution (NSDAR or DAR) is a non-profit, non-political, patriotic women's service organization. Our chapter, the Nancy McKay Harsh Chapter NSDAR, is named after Nancy McKay Harsh. She was born on June 14, 1810, in Mercer County, Pennsylvania. 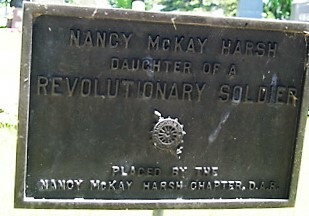 Her father was William McKay, who was a soldier of the American Revolutionary War. Nancy’s maternal lineage is traced back to northern Ireland; her father’s ancestors were among the James River settlers. In 1833, Nancy married Daniel Harsh, a Pennsylvania Dutchman. Shortly after the marriage, they became pioneers, and almost frontiersmen, as they moved to Clinton County, Ohio. 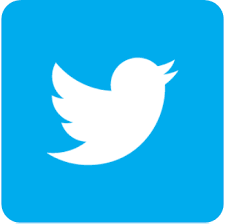 They settled in the thickest of forests and commenced the long, hard task of clearing the land for cultivation. Nancy took an active part in field work by doing the work of a man. She had grown up in a life of luxury and this was a new change in her life style. After years of hard toil, they cleared 100 acres of land. Daniel decided to sell his possessions, and they planned to move further west to Illinois. As the arrangements to move were almost completed, Daniel unexpectedly died. His passing left Nancy with six young children and another on the way. The oldest child was 13 years old. Nancy gathered up their belongings and, with the children, drove a covered wagon to the fertile land of Illinois. There, she purchased 80 acres which eventually grew to 360. After several years she again moved westward with two sons and the daughter born after her husband’s death. 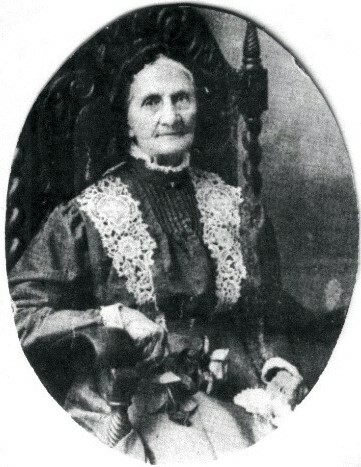 Nancy settled in Union County, Iowa, in 1861. When she married Daniel Harsh, she followed her mother's style of dress, by wearing a white bonnet at all times. After her husband died, she changed the color of her bonnet to black. There were always two bonnets – one for every day and one for Sunday or special occasions. Her cap was one of her distinctive trademarks. To some of her family and friends, it seemed to be simply her personality. A birthday party was held on her 100th birthday at the home of her son, Senator J. B. Harsh. It was attended by many friends, as well as the four of her seven children who were still living. Four generations of her family were present. Nancy McKay Harsh died in the home of her daughter, Mary Donlin, on August 7, 1912. 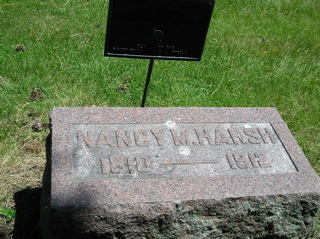 Nancy is buried at Graceland Cemetery, Creston, Iowa. 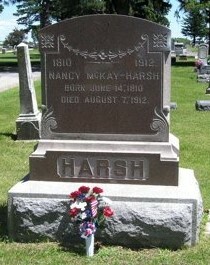 Her grave was marked in 1928 by the Nancy McKay Harsh Chapter NSDAR. Florence Babbitt donated the marker. Her daughter married Nancy McKay Harsh's grandson.